SEOUL/WASHINGTON (Reuters) - It's been the better part of a year since U.S. President Donald Trump and North Korean leader Kim Jong Un stood face to face for the first time at their unprecedented summit in Singapore. The past year was a see-saw of occasional public meetings - and canceled visits - between American and North Korean officials. U.S. Secretary of State Mike Pompeo traveled to Pyongyang multiple times, first being condemned by North Korea over "gangster-like demands" for the North's complete, verifiable, irreversible denuclearization, then later earning Kim Jong Un's "satisfaction" with another meeting. Throughout all these talks, as well as other behind-the-scenes negotiations, neither side announced major new steps toward denuclearization, easing sanctions, or establishing a new "peace regime" for the peninsula. 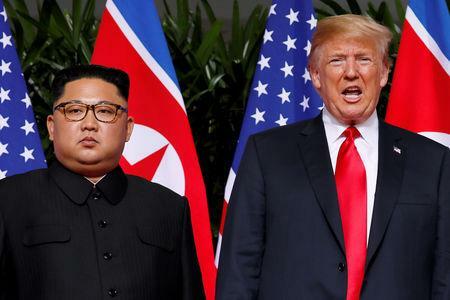 Statements carried by North Korean state media complained about Washington's opposition to signing a peace declaration or easing sanctions until North Korea takes more steps toward denuclearization. But Biegun said a "dozen" agenda items were discussed, one of the lawmakers said, and North Korea has called for easing sanctions, restarting some inter-Korean economic projects, opening a U.S. liaison office in Pyongyang, and signing a declaration formally ending the technical state of war from the 1950-53 conflict. North Korea's state media said in December that Pyongyang's commitment to the "denuclearization of the Korean peninsula" also includes "completely eliminating the U.S. nuclear threat to Korea," but did not spell out specific steps Washington should take.